567 Universal Programmer, Other module for modular synthesizer from Moon Modular. Moon Modular introduced four new mixer, quantizer and programmer modules at NAMM. 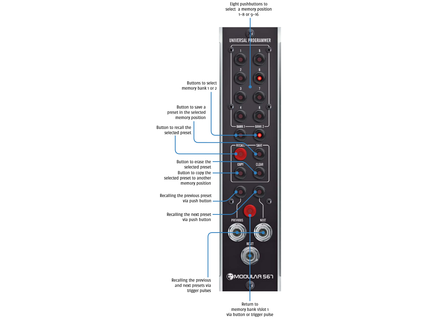 The 525 MCP Mixer-Attenuator is a bipolar 4-channel mixer for audio signals and control voltages with master-level control, channel on/off switches with status-LEDs as well as inverted and non inverted outputs. The 4 input jacks are daisy-chained and input 1 is fed with a +10 volts fixed voltage, as long as nothing is plugged in there. Le 565 V3 Quad Quantizer features 4 independent quantization circuits. The module quantizes variable control voltages into semitone intervals (1/12 volt) on an input voltage range from -10.58 to +10.58V, or over 2 x 10 octaves (2 x 128 semitones). Each channel includes a Voltage in, a Quantized out, a Gate in and out; Gate pulses fed into the Gate in jack trigger the quantizer. Le 565 D Quantizer Controller allows to limit the output voltages generated by the M 565 M3 Quad Quantizer to any desired key, chord or note interval. The 12 keyboard-like arranged push buttons on the right can be activated or deactivated in any combination. Lastly, the 567 Universal Programmer provides storage for the M 568 and M 565 D and more modules to come. The non volatile memory of the module comprises 2 banks with 8 memory slots each. They are selected by the two "Memory Bank" buttons and the eight "1...8" buttons. Pushing the "Recall" button activates a saved preset. More details on these new modules are available on www.lunar-experience.com.